This ground lease is designed for a transaction wherein the landlord leases the tenant a site for construction of a small office building. The lease contemplates that the tenant will build all improvements on the site, after first demolishing the existing improvements. The tenant has a series of renewal options, as well as an option to purchase the property and a right of first refusal for the premises in favor of the tenant. Landlord does hereby lease, demise and let to Tenant, and Tenant does hereby lease, take and accept from Landlord, pursuant to the terms and conditions hereinafter set forth, the Land. The term of the Lease and the payment of rent hereunder shall commence on or about __________ (the "Commencement Date"). If Tenant is not able to secure a building permit for the Improvements (as hereinafter defined) on or before __________, either party may terminate this Lease without liability to the other party. The initial term of this lease shall be for ten (10) years commencing on __________ and ending on __________. A. Tenant shall at its expense demolish the existing building on the Land. Also at Tenant's expense, Tenant shall engage an experienced, qualified contractor to construct a building on the Land to accommodate the operation of an office building (the "Improvements"). Tenant shall cause the construction of the Improvements to be completed, at its own cost and expense, in a timely manner, in a good and workman-like manner with good materials, in accordance with the provisions of this Lease, and in compliance with applicable laws, rules and regulations. B. Within ten (10) business days after receipt of written request from Tenant, Landlord agrees to join in any and all reasonable applications for zoning and rezoning and for Permits in connection with the construction, operation, and maintenance of the Improvements, and shall also join in any grants or easements for electric, telephone, gas, water, sewer, and other public utilities and facilities, or access roads, or other facilities useful and/or necessary to the operation of the Improvements or the construction thereof. B. 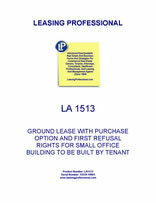 In addition to the Rent, Tenant agrees to pay all costs pertaining to the Improvements and/or Land and to the ownership, operation, and use thereof during the term or any renewals thereof, it being the agreement between Landlord and Tenant that this is a fully net lease, and Landlord shall not pay any costs or expenses pertaining thereto during the Term. Tenant shall have the option to renew this Lease for three additional ten (10) year terms. Such renewals shall automatically take place unless Tenant gives notice to Landlord at least one hundred eighty (180) days before the end of the initial term of this lease or any renewals thereof, that Tenant does not wish to renew this Lease. All of the terms and conditions of this Lease shall remain in force during any renewal terms except that the Rent for the first year of the first renewal (the "Base Year") shall be $________ per month. At the commencement of the second year of the first renewal, and annually thereafter including subsequent renewals, the Rent payable by Tenant shall be increased to an amount determined by multiplying the Rent by a fraction, the denominator of which shall be the most recent Consumer Price Index figure, as hereinafter defined, published prior to the Commencement Date, and the numerator of which shall be the most recent Consumer Price Index figure published prior to the particular anniversary date; provided, however, that in no event shall the rent for any month after such anniversary be less than the rent for the month immediately preceding such anniversary. As used herein, the term "Consumer Price Index" shall mean Consumer Price Index for All Urban Consumers (CPI-U) for the U.S. City Average for All Items, 1982-84=100, or the successor of that Index, as published by the Bureau of Labor Statistics, U.S. Department of Labor. Should Landlord lack sufficient data to make the proper determination on the date of any adjustment, Tenant shall continue to pay the monthly rent payable immediately prior to the adjustment date. As soon as Landlord obtains the necessary data, Landlord shall determine the rent payable from and after such adjustment date and shall notify Tenant of the adjustment in writing. Should the monthly rent for the period following the adjustment date exceed the amount previously paid by Tenant for that period, Tenant shall forthwith pay the difference to Landlord. Should the Consumer Price Index as above described cease to be published, a reasonably comparable successor index shall be selected by Landlord. If Tenant objects to the successor index, the dispute will be resolved and a successor index designated by arbitration pursuant to the rules and procedures of the American Arbitration Association. In the event that any payment required by Tenant under the provisions hereof shall be more than five (5) days past due, Tenant shall, upon demand, pay a late charge to Landlord in the amount of Five Percent (5%) of the past due payment and such late charge shall be deemed Rent for all purposes under this lease. A. Tenant shall pay, prior to delinquency, all real estate taxes, assessments and charges which are levied, imposed, or assessed upon or against the Improvements and/or the Land with respect to the tax years during which this Lease is in effect. If Tenant shall fail to pay any such taxes, assessments, or charges prior to delinquency, Landlord shall have the right to pay same and to include such amount as Additional Rent due from Tenant. B. For purposes of this Paragraph 6, the term "real estate taxes and assessments" shall include any real property tax or public charges or community association charges against the Improvements and/or the Land analogous to a real property tax for services thereto, including assessments by any County, Municipal, Metropolitan District or Commission, or other public duly constituted authority. C. Tenant may protest, appeal or institute other proceedings to effect a reduction or abatement of real estate taxes and assessments with respect to real estate taxes and assessments levied against the Improvements and/or the Lease for any tax fiscal year that ends after the Commencement Date of this Lease. Such protest, appeal or other proceedings may be conducted in the name of Landlord or Tenant as Tenant may consider appropriate. To this end and at Tenant's expense, Landlord shall cooperate with Tenant and furnish to Tenant appropriate documents and information. If the protest, appeal or other proceedings are successful and any real estate taxes and assessments are refunded, the refund shall be paid to Tenant.